I remember the day clearly. I walked in to SICFIT Scottsdale for my regular workout, looked my fitness mentor Luke Kayyem square in the eye and announced “I’m going to run the Great Wall Marathon”. The look on his face will stay with me for the rest of my life. It was a look that, without hesitation said “YES, let’s get after it”. It was almost as if he was accepting the challenge as much as I was. In my eyes, it’s fundamental to what the TRIBE is all about. It’s about building unflinching confidence in yourself and your abilities. Upon my next visit to the gym, Luke already had the white board consumed with food, supplements and activity planning under the heading “The Road To China”. Yeah, as I’ve known all along, I’m in exactly the right place. Now, truth be told, as impulsive as this all sounds, my path to China likely began a long time ago. As a teenager, I distinctly remember my first exposure to “The Marathon”. It was watching Frank Shorter win the 1972 Olympic Marathon in Munich. ABC Sports, and Jim McKay in particular, did a great expose on the Marathon event and it’s historical significance etc. and the young impressionable teenager that I was simply ate it up. I was determined that I was going to run a marathon and I would start training the next day. “Wait, how do you train for a marathon? Do you just run every day until you can go the entire distance?” Reality quickly set in. I attended a very small high school in the midwest. We didn’t have track coaches or a track team. We could barely support basketball, baseball and wrestling of which I participated in all. Hell, it wasn’t that a formal “training program” was not a reality, it didn’t even enter my young psyche. All seemed like noble pursuits for a young man. Little did I know how accurate that concept would turn out to be much later in life because deep down inside, I knew that even though I failed in this first attempt, I was not done chasing the marathon. That “later in life” moment manifested itself as a direct result of a program Luke created at SICFIT called “The Fittest Tribe Alive”. It’s a program that gathers a group of people, men, women, young and old, together and as a collective you train for an epic event. In our case we were the inaugural group for the program and trained for “Cactus to Clouds.” C to C is an epic one day climb of Mount San Jacinto right outside of Palm Springs ranked as the 5 th most difficult one day hike in North America. A few months previous to the beginning of our Tribe training, I had completed my first Half Marathon. And so, the seed was planted. Luke and the TRIBE program simply nurtured, watered and fertilized that seed into a full-grown dream. 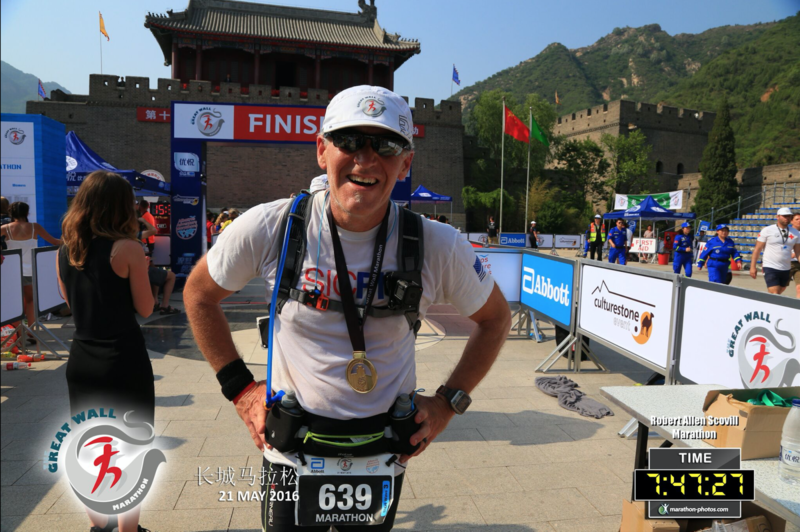 And as luck, providence or destiny would have it, that dream was now looking me square in the eye as my business life would take me to Beijing two weeks before the 2016 Great Wall Marathon. I simply knew that if I did not take this on, not doing so would haunt me, maybe for the rest of my life. It’s funny how often in your life things can fall in to place if you’ve put in the work to prepare for it, have a keen eye for the signs of it’s arrival and then are wise enough to get out of your own way and allow it to happen. From 2013 through 2015 I was coming off of two pretty intense left knee surgeries in two years. The drive toward some of my fitness goals such as reaching the half marathon distance and conquering Tough Mudder among others had given me great incentive to work really hard through an intense rehab period. But with regard to running a marathon, in the back of my mind was always this nagging little thought of “I wonder if I have the right stuff to do that?” As my experience as a young teen was quick to remind me, it was not a given. So off Luke and I we went on our “Road to China” program. As I’m sure Luke could attest, I’m a bit of a “prepper” and I freely admit, I have a tendency to (over) prepare for activities in my life and fitness is no exception. I love the gym. I’m a “dyed in the wool” gym rat. In fact I freely admit that I probably enjoy the gym and doing “the work” more than I actually enjoy doing the event that I’m training for. As I would learn, that mentality would come dangerously close to derailing my dream. (remember what I said about getting out of your own way?) At T-Minus 16 weeks and counting, I had signed up for not only two of “The Fittest Tribe Alive” events, which would include not only training for an intense abbreviated version the Mt. San Jacinto climb, but a 12 mile Tough Mudder 60 day later. This was obvoulsy more than enough activity to include along side a marathon training program. But, (unknown to Luke) I had also signed up for IMS Half Marathon, The DBacks Cancer Run, The Pat Tillman Run, Rugged Maniacs 5K Mudder, Run The Runway 10K and a trio of other 3k Mudders, all while training 4-5 days a week at SICFIT. Yeah, I know what you’re thinking and you’re right. My motto is “anything worth doing, is worth overdoing”. 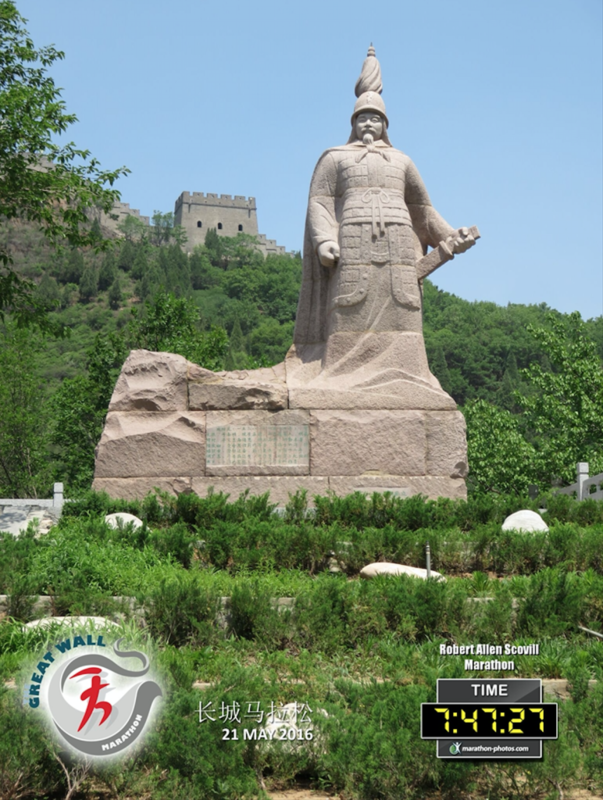 At T-Minus 6 weeks to the Great Wall, my legs were shot. My run performance was suffering horribly and I had plateaued at about 15-16 miles. My physical performance was actually declining and mentally, doubt was starting to creep in. Not a good sign just a few weeks away before my first marathon, one ranked as 4th hardest in the world. To say insecurity and doubt was coming up fast in my rear view mirror would be an understatement. This is where trust in GREAT, level headed coaching based on actual experience makes all the difference in the world. And so my mentor Luke Kayyem readdressed the white board with an adjusted plan, and that plan was based on a lot of rest, “time over task” walking and un-weighted range of motion work right up until race day. NO running! In short it was based on an intense period of recovery BEFORE the race. Unconventional to say the least and to say it bread confidence in me would simply be untrue. May 21 st 2016. Race day. 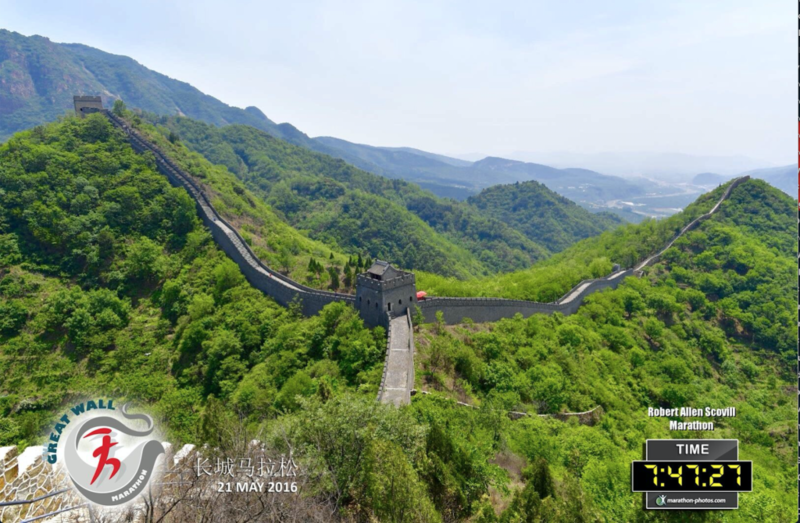 After a walk through of the course the day before, it was apparent to me that “The Great Wall marathon” was simply going to be a war of attrition. It’s not your every day marathon by any stretch of the imagination. It throws extreme elevation challenges at you at very strategic points in the race. You essentially have two, one hundred story stair climbs at extreme incline, one at the 4 mile mark and a more extreme version at the 21 mile mark preceded by a long and mentally grueling set of inclines through the cities surrounding the structure. It, as much as anything I’ve ever attempted, was a test of mental toughness and sheer will as much as it was physically challenging. My race strategy coming in to the race simply went out the window. For me, this was going to be about survival and finishing without any concern for time. But, this is where following the lead of experienced trainers who offer expert programming based on experience and the ability to adapt and survive is your savior. And this is also where training with a group of intensely supportive and like-minded individuals, as opposed to training in isolation, becomes your ace in the hole. Over the past five years at SICFIT I’ve heard and ingested those words from coaches and classmates at every session and ya know what? Every one of their voices was with me at some point during that race urging me on. I’m not joking, I heard them all clear as a bell. And the awesome part of the experience was this; toward the end of the race, after enduring a gut wrenching set of cramps during mile 19. When I hit the infamous glycemic wall at 20 miles where all of your glycemic stores are depleted. “I can.” “I will.” “I am.” I heard all of those same comments all over again, but this time was different. This time they were in my voice, not the voices of my classmates and coaches. I somehow, and I still don’t know how, ran the last 3 miles of that race very close to my regular pace. And so, in the end I accomplished what I set out to do. No, not complete one of the most grueling marathons out there. No, I set out to find out what I was made of and whether I had, not only the physical make up, but more importantly the mental make up to do achieve this goal. 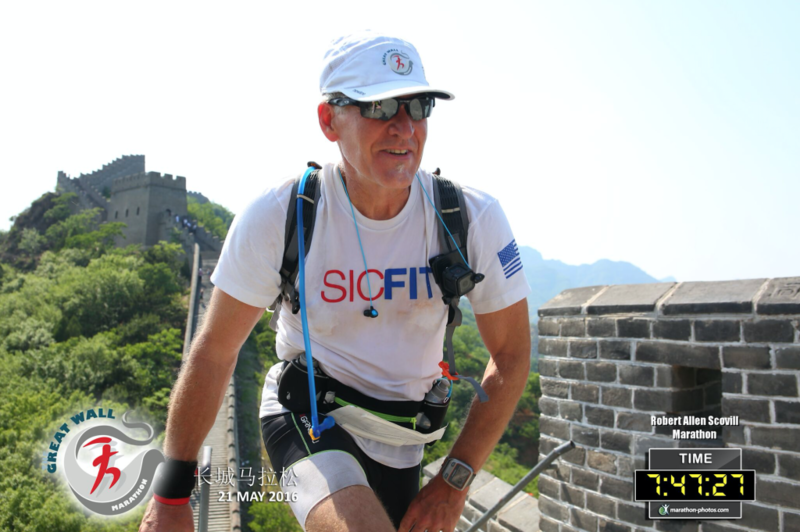 I needed to know whether I had the “right stuff” to take on and conquer the 4th hardest marathon in the world. So inspiring Robert. You are truly an amazing mentor to me. Thank you for pushing further and pushing us, your classmates! !